I’m excited to be sharing yet another amazingly delicious Amish recipe with you today. (Aren’t all Amish recipes amazingly delicious?) I’ve been on a lemon kick lately and these bars did not disappoint. I’ve actually never had lemon bars before, but I’m so glad I made them because they were super easy to whip up and they tasted incredible. Even my husband who isn’t a sweet person (weird, I know) had like 4 servings in one sitting. Step 2: Mix crust ingredients with fork or pastry cutter until crumbly. Step 3: Pour Mixture into greased 8×8 pan and bake for 15 minutes. Step 4: Combine filling ingredients in order given and pour over baked crust. Step 5: Bake for 25 minutes and cut into bars once cooled. Do you have a favorite lemon recipe? Are you a fan of Amish cooking? I’d love to know! Mix crust ingredients with fork or pastry cutter until crumbly. Pour Mixture into greased 8x8 pan and bake for 15 minutes. Combine filling ingredients in order given and pour over baked crust. Bake for 25 minutes and cut into bars once cooled. I have pinned this and added it to my Sweet Treat board. I have so many lemons and can't wait to make this. Linking up from Modest Mom. Oh my goodness! These look delicious. Thanks so much for sharing. LOL it's really easy to eat a whole pan... I haven't tried them with whole wheat, but you could probably get away with 50 white/50 whole wheat. really late reply, I know, but if you use whole wheat PASTRY flour, they come out great. Thanks for sharing and I'm so glad you enjoyed them! I LOVE THESE BARS!!! My hubby is a huge lemon fan! He loved these! Thanks for letting me know. My husband loves them as well! Found this recipe today and have it in the oven baking right now, it sounded so delicious! Smells great too. Yum, my mouth is watering! 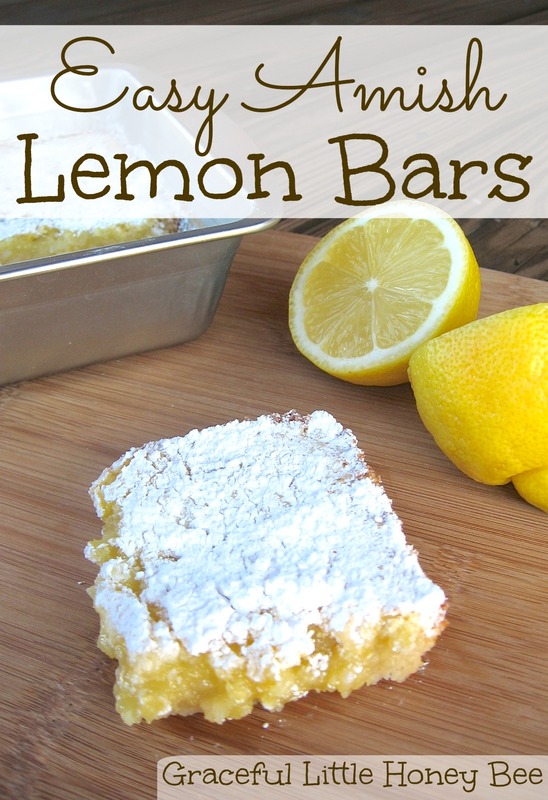 I love lemon bars and I am heading into the kitchen to see if I have all the ingredients to make these!! Have made these a few times now - so easy and GREAT! My tweaks were to sub baker's sugar instead of powdered sugar (just as fine, but less chalky) and to add in as much lemon zest as I could stand, about a 1/2 tsp into the crust and a good 2 tsps into the topping. I think adding more juice might make it runny, so for those wanting an EVEN LEMONIER taste, zest is the way to go. These are just dreamy. Thanks for the easy recipe!